Ukraine is a nation in Eastern Europe. Based on area, it is the largest country which is entirely located within Europe, sharing borders with Russia to the east and northeast, Belarus to the northwest, Poland and Slovakia to the west, and Hungary, Romania, and Moldova to the southwest. Due to the richness of its soil, the advantageous climate and its strategic location near to the Black Sea and Sea of Azov, Ukraine has been a much desired land for Russia. The total population in Ukraine has been steadily decreasing and is estimated to decrease further over the next few years. In 2017, the total population in Ukraine was estimated to amount to around 42.3 million inhabitants. Its largest city, Kiev, is also its capital. The government in Ukraine is largely criticized by the Ukrainian people, in a survey held in 2015, for example, almost 80 percent of the respondents stated that they do not have confidence in the national government. Russia is the Ukraine's most important trading partner, most of Ukraine’s import and export business is carried out with its eastern neighbor. However, their relationship hasn’t always been peaceful: Since gaining its independence after the collapse of the Soviet Union in 1991, Ukraine has sought to establish closer relations with Western Europe as well as reconcile with Russia, the country which supplies most of Ukraine's energy. But in 2014, pro-Russian separatists seized regions in eastern Ukraine which caused a civil war. 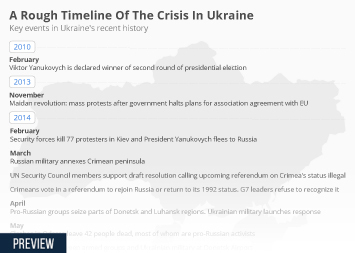 In addition, following the fall of pro-Moscow President Yanukovych, after abandoning a deal with the European Union in favor of stronger ties with Russia, Russia annexed Crimea and caused an even greater social and economic crisis in Ukraine in early 2014. A survey conducted among adults in Ukraine amidst the civil unrest showed that half of the population wanted Crimea to be declared an autonomous republic within Ukraine. In addition, over half of the population stated that if a referendum were to be held in 2014 during the civil crisis and demonstrations, they would vote for the Ukraine to join the European Union. Reasons for this sentiment probably include the living conditions; during the crisis in Ukraine between 2013 and 2014, a survey suggested hat the standard of life in Ukraine was below average and seemed to decline. Despite its large industry, Ukraine has been reporting a trade deficit since 2006, which only entered surplus territory again in 2015, but fell again in 2016. As a result of increased energy rates imposed on Ukraine by Russia, consumer prices in Ukraine have increased drastically. The inflation rate in Ukraine in 2015 increased by almost 50 percent in comparison to the previous year, but was estimated to slump to only 14 percent in 2016 and even lower in the following years. More interesting topics from the industry "Ukraine"